As a working Magician, I have been to many, many weddings! And you know what, every single one is different! Some very traditional and some very much ‘out there’! I was at a wedding recently where everyone wore white?! And there was me thinking that was the bride’s job?! Some weddings indoors, some out, one even in a tree house!! They can be all unique and very different. The one thing that is always the same is that there are always different groups of people that, although they know the bride and groom very well, they don’t know each other – and there is always that slightly awkward moment for some when you are all standing around together, not knowing anyone whilst the newly weds are taken off for their photos. Well, that’s where I come in! I don’t want to blow my trumpet too much, but here goes TA-TA-TA TA TA TAH! (That sounded like a trumpet in my head) – I’m very good at bringing people together and getting the conversation flowing. Magic works very well that way, as whilst I’m performing my variety of tricks, I’m introducing your guests to one another, getting them laughing and hopefully after impressing them as I walk away to the next guests, the previous are chatting away! This works very well indeed. Not just during the photos though! During the Wedding breakfast works well also too when individual tables are being served and others are still waiting and between courses! And of course, your evening entertainment – when your guests are standing by the bar, (those who don’t dance) or even when new guests arrive to joint in the celebrations, you may want some entertainment for them too! 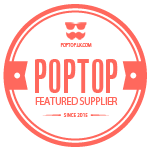 Like I said at the start of this blog – every Wedding is different and you might have your own ideas where and when and how you want your entertainment. 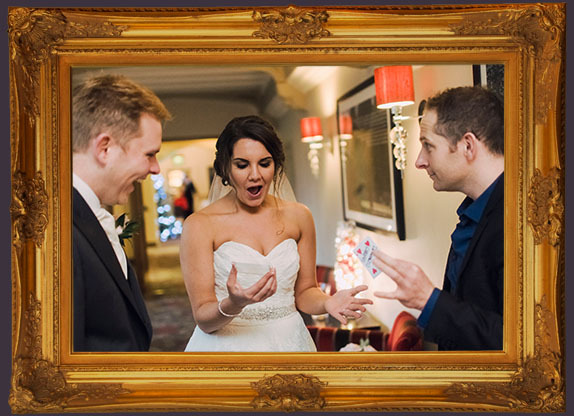 Well, if you need a bit of Magic and a Wedding Magician with a difference, give me a call – I’d love to add that extra little bit of fun to your already very special day! !